Cloth Diapering is often the choice for Eco-friendly moms; it keeps diapers out of the landfills, but we often overlook the disposable baby wipes. 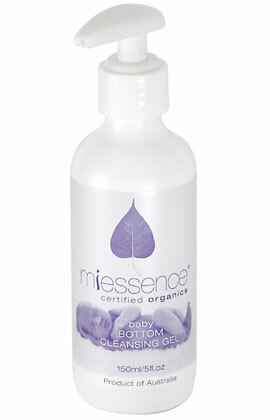 Now you have the option to go with cloth wipes with Miessence Baby Bottom Cleansing Gel. A very gentle, yet effective cleanser for nappy change time. Soothing organic marshmallow, chamomile and calendula clam and soothe baby’s sensitive skin. Organic aloe vera inner leaf gel and yucca juice gently cleanse and soothe baby’s bottom. A hint of organic vanilla helps neutralize odors. Gentle enough for newborns. I must confess, initially I was using it like a soap while washing Layla’s bottom. However, it’s meant to go on the baby and wiped with a cloth. I guess I should have read the direction before applying. I really love this alternative to disposable wipes. It does clean very nicely and there is no harsh chemicals that your baby comes in contact with. Miessence Certified Organics is a green company that was founded in Australia and their policy is to use only 100% natural and organic ingredients. Miessence is also the world’s first certified organic skin care. This is a brand that you can trust and rely on. They have just introduced the baby range which includes products such as baby barrier balm, baby lotion, and wash. Give your baby the gift of natural and chemical free life with these wonderful products. They are availabe at Ely Organics, your online source for Miessence products. I cloth diapered both kiddos and used cloth wipes moistened with (gasp!) water. Worked like a charm. Yeah… we did EC so didn’t need wipes much anyway, but when we did, just cloth and water. This is probably good for diaper rash, with the soothing ingredients, but if you’re cleaning properly (and giving enough diaper-free time) you don’t get much of that anyway.